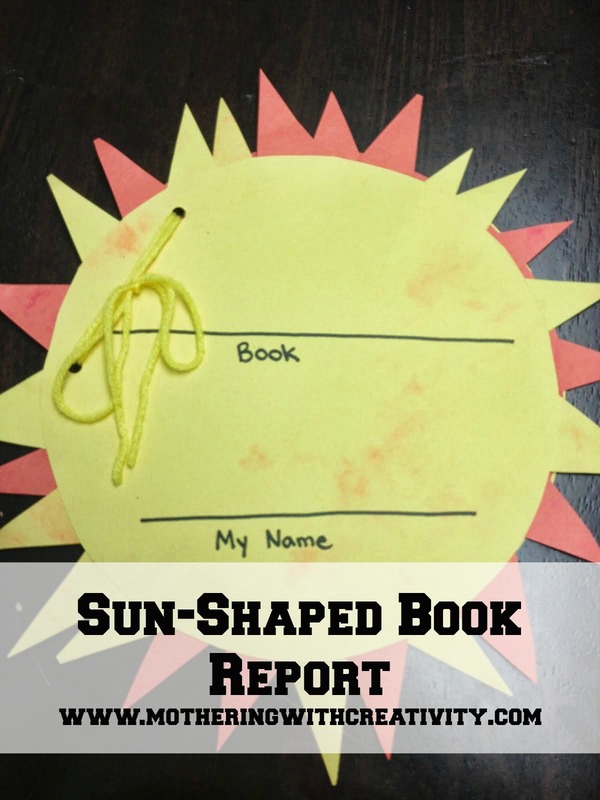 This sun-shaped book report is perfect for 1st and 2nd graders. Cut out 4 large circles from yellow paper (I actually did two yellow and 2 orange). Using the scraps of paper left over from your cut-out circles, cut small triangles. Allow your child to glue the triangles to the back of one of the circles (this will be the first page of the report). Label the pages using a sharpie and a ruler. Front Page: "Book" and "My Name"
Assemble the book by punching 2 holes (about 2 -3 inches apart) in the upper left hand corner. Tie it together using yarn or string (I used yellow yarn). 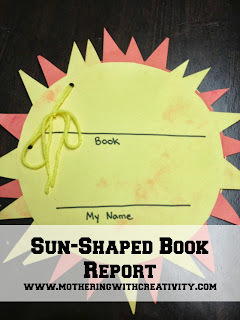 Finally, when your child is ready, she can fill in the spaces of each page of her book report! If your child is young or if it's their first time completing something of this sort, you can expect that these sections may be very short. Over time and with practice, these sections will more fully develop. Remember when you said you wouldn't homeschool? Why was that? I love your homeschool addition to your blog. Hehe. I do remember that. Very well. Oh, I had a million reasons why I'd never homeschool. 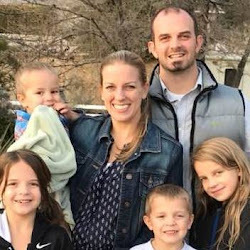 They all changed when I A) actually had children of school age B) had a child like Ellie who academically could skip a grade and would be incredibly bored just starting kindergarten this year (minus friends) and C) realized our public school options kinda sucked. Sigh. It's one of those "certain" decisions you throw out there before you actually have kids that I simply had to reevaluate.